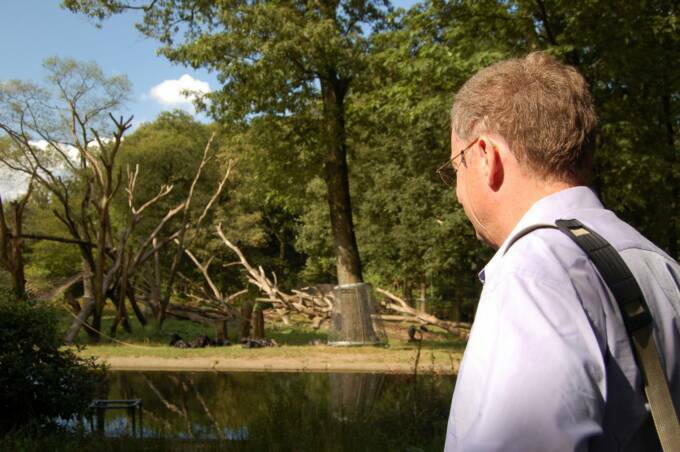 Between 1977 and 1984 Nikkie (the chimpanzee you see on the right) was the most powerful chimpanzee in the Netherlands. During that time, Nikkie was the alpha male of the famous Arnhem Zoo chimpanzee colony, the largest semi-captive chimpanzee group in the world. The book "The most powerful chimpanzee of the Netherlands" gives a personal insight into life and death inside this chimpanzee group, based on intensive observations. Aggression, reconciliation, grooming, baby and child-care, teasing, sexual bargaining and separating interventions are recurrent themes. The book contains some exciting observations. The comparison with aggressive behaviour and play led to the hypothesis that quasi-aggressive behaviour is a form of social exploration, a means for youngsters to learn about their social environment. 2. Investigating authority, directed by male youngsters towards adult males. Social learning in young chimpanzees does not occur only through observation, imitation and conditioning, but also through the exploratory activities of the youngsters themselves. As youngsters grow older, gradual changes occur in the nature of the behaviour displayed and in the objectives the youngsters try to achieve. Young chimpanzees in the Arnhem Zoo chimpanzee colony are frequently observed throwing sticks and stones at adult groupmembers, slapping or punching them. This behaviour becomes noticeable at the age of two and continues until adolescence at about the age of nine. Even occasional punishment does not discourage the youngsters from persisting in this type of annoying behaviour, also referred to as teasing, pestering, harassment, provocative behaviour, etc. Central figure in the story is Nikkie, one of the lead characters in the film The Family of Chimps by the internationally renowned Dutch cineast Bert Haanstra. Several months after that film was finished, Nikkie tried to jump the moat surrounding the enclosure and drowned. His death, and the power struggle leading up to it, received to a lot of media attention (and later made it into the play Hominid). Some journalists tried to turn Nikkie's death into a suicide, which it wasn't. A year after Nikkie's death, film pictures were shown to the entire group, with remarkable results. 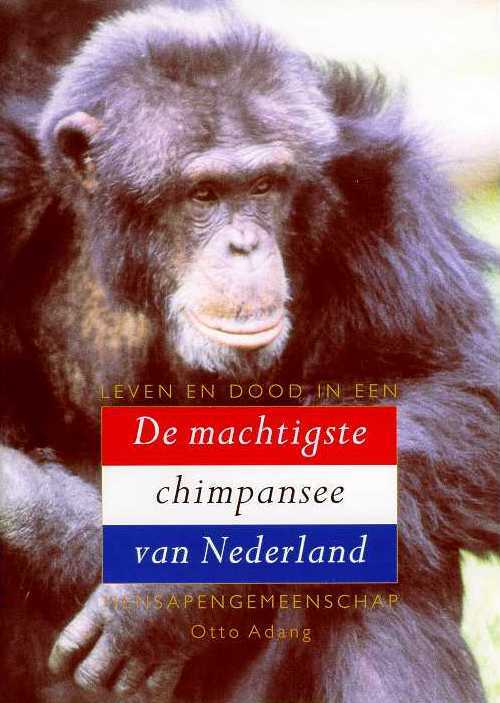 "The most powerful chimpanzee of the Netherlands" is at the same time the book accompanying the film, and the sequel to "Chimpanzee Politics" by Frans de Waal. 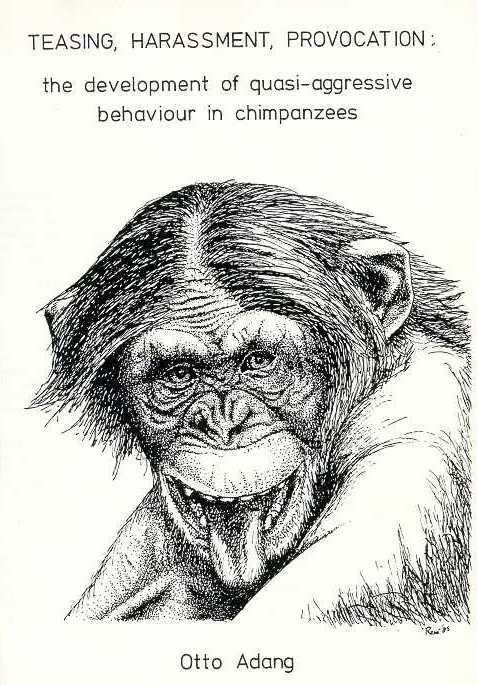 In addition, it describes results of research on teasing and the development of quasi-agressive behaviour in chimpanzees. Chimpanzees are our closest living relatives. Behavioural research, both in Africa and in zoos, has given us a lot more information about the behaviour, the way of life and the social and intellectual capabilities of chimpanzees. Over the years, endless discussions have taken place about similarities and differences between man and other animals, especially apes. What is the use of comparing humans and chimpanzees?